With a B.A. 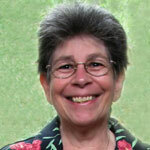 in English literature, Mim Eisenberg spent thirty years excelling in high-level office administration, enhancing her multi-dimensional skills as she did full-charge bookkeeping, administered contracts for U.S. government projects, and wrote manuals for quality assurance, personnel policies and office procedures. Mim launched WordCraft in 1992 from her home base in New York City. Mim's first oral history tape transcription client was Columbia University's Oral History Research Office. After moving to the metropolitan Atlanta area in 1994, Mim began transcribing for clients in the Southeast. Soon she was serving a national clientele. Her value-added services have made her clients a source of repeat business and referrals, and she is proud to have built a nationwide network of satisfied customers. Mim takes ownership of each project, which she transcribes and proofreads herself, and alone ensures the excellence of each transcript. Mim claims she was born with a red pencil in her hand, but she got her B.A. degree anyhow. Her editing and proofreading clients attest to her mastery of the English language and her ability to improve even a good writer's product. Whatever the project, if Mim edits or proofreads it, you will always "Look Your Best in Print."